Warhorse, the heartwarming story of perseverance has made it's way to Blu-ray and DVD, and this is one film you won't want to miss. This is an incredible story of friendship, courage, and faith that will have the entire family on the edge of their seats routing for Joey (a beautiful colt) and his beloved trainer, Albert. Albert and Joey posses an admiral tenacity, both moving through every obstacle with a graceful drive to one day return home. Even when Joey is ultimately separated from his friend (and trainer) during the War, the unbreakable bond is still visibly strong. This special bond is essentially what gives them the courage to meet and overcome the many challenging hurdles that each of them has to face. This film showcases one of the most incredibly moving stories of friendship, courage, faith, and pure will. The inspiring storyline, gorgeous costumes, scenery, and visual effects create a viewing experience that's not soon to be forgotten. Definitely a film for the entire family; simply spectacular! Steven Spielberg is one of the movie industry’s most successful and influential filmmakers, as well as a principal partner of DreamWorks Studios. He is the top-grossing director of all time, having helmed blockbusters including Jaws, E.T. : The Extra-Terrestrial, the Indiana Jones franchise and Jurassic Park. It’s very rare that a project is successful as a novel, as a play and as a movie – but War Horse is all three. Why do you think the story is so versatile? The bones of the story of War Horse is a love story. That’s what makes it universal. It was that way in the book and it was certainly that way on the boards in the West End of London. That’s also what we hoped to create with our movie adaptation. What makes War Horse unique? I don’t often mix my metaphors, so what makes this movie unique is the fact that it’s a story of love and a story of war. This isn’t a typical war film. This is not Saving Private Ryan. This isn’t Band Of Brothers. If you really look at this movie, there are only 12 to 15 minutes of combat from the cavalry charge to the fighting in the Somme. I wanted families to see this picture together. That’s why there’s hardly any blood in this movie. What do you think younger audiences will learn from watching the movie? Children learn exponentially from media today, so we felt responsible for there to be truth in the history of the first World War in our adaptation. We did a lot of research and the thing that really struck me was the vast number of casualties among the horses. It wasn’t just the men who died on the American, British, French and German side – but there was a huge number of casualties among the horses, too. I think kids will be interested to learn that this was the era where the machine – the tank, the airplane and even chemical warfare – all converged. It was almost like an experimental war. It was the war to end all wars. At least, that’s what they thought back then. Why do you have such a fondness of telling historical stories? I love history. To be honest, it was the only subject I did well at in school. I’m not ashamed to admit I was not a good student, but I was great at history. My dad fought in World War II and he turned 95 in 2012. He was based in Karachi, which is now Pakistan, and he fought in Burma against the Japanese – and I used to love it when he told me war stories. I grew up hearing them. My first 8-millimeter movies when I was 13, 14 and 15 years old were mostly about war. They were mostly World War II movies. Another point to add is that war throws characters into chaos. There’s no better way to test a person than to put them in the middle of a war. That’s clearly going to show what kind of a character you’re telling a story about. What made the young actor Jeremy Irvine – who plays Albert Norcross in the movie – stand out during the casting process for War Horse? I looked at hundreds of potential Alberts, but Jeremy Irvine stood out because he had an ineffable quality that certain stars have – or certain exceptional people have – that makes them stand out and rise above the rest. I looked at hundreds of very interesting actors and newcomers, but nobody had the heart or the spirit or the communication skills that Jeremy had. He possessed those qualities even in silence, even without speaking. Jeremy tested five times and he got better and better. I’m very accustomed to working with actors who have no experience. You can look back at E.T. with Drew Barrymore and Christian Bale in Empire Of The Sun to see that. They had never made a movie before, but I see a very similar career in store for Jeremy. What is the appeal of newcomers? Often what happens is you get a newcomer in front of the camera and they freeze up or they imitate actors and other performances they’ve admired and they stop becoming themselves. My job as a director is always to return them to what I first saw in them, which was simply an uncensored human being. I really trust the authenticity of real people and my job is to get them to be themselves in front of the camera. The movie doesn’t shy away from the fact that many horses suffered during World War I. How did you manage to portray this without harming any animals? Nothing was ever done to the horses to put them under any stress. That was very, very important to all of us. Bobby Lovgren is the name of the man who trained the horses and guarded the horses – and it was incredibly important to him to keep them safe and protected. We also had a woman from the Humane Society on set every single shooting day. When I first met Barbara, I said to her, “You’ve got the power over me.” She replied, “What do you mean?” I said, “If you ever see an animal under any kind of duress, you can say ‘Cut.’” I gave her the chance to stop a take or to even stop a take from even being taken. There is a glorious old-fashioned feel to War Horse. Did you dip into childhood memories of directing heroes like John Ford when you were making the movie? Yes, of course. My heroes are John Ford, Howard Hawks, Raoul Walsh, David Lean, Lewis Milestone, Victor Fleming, Michael Curtiz – and many more than that, too. It goes beyond American directors because this is a very British film, so I was incredibly inspired by Britain. At the same time, the works of John Ford in How Green Was My Valley and The Quiet Man were very evocative. He painted beautiful landscapes and he included the land as part of his storytelling, so how could we not include Devon and Dartmoor in this picture? The land was a character itself and in a sense, that’s what a lot of the old directors did – they featured the land they were standing on. It’s fun when you get to put on a wide-angle lens and not just shoot close ups for an entire movie. Scarcely has the English landscape looked so great on film. What were your initial reactions to the movie shoot locations in Devon and Castle Combe? Castle Combe looks like Hollywood built it. It doesn’t look real, but it’s beautiful, it’s very authentic and it’s very old. The Devon location has some of the most natural wonders in all of England with its beautiful tors. The tors are built up in a very unusual way and I’ve only seen something like this one other time in my life – and that was in New Zealand. There’s nothing in the world like the landscapes of Devon. We couldn’t believe our eyes. The English weather is notoriously unpredictable. Did you use any digital manipulation to depict the glorious skies in the movie? see in the movie are the skies that we experienced – but it was definitely challenging at times. It took three days to shoot the spectacular sunset at the end of the movie because the sun goes down awfully fast in Devon. We had to come back again and again to get matching skies to make that whole sequence work, but it was all worth it. The music has a huge emotional impact in War Horse. Can you talk about your work with the movie’s composer, John Williams? John and I have had a 40-year relationship. We started working together in 1972 on Sugarland Express and he is the most important collaborator I’ve ever had in my career. He’s made me look good. He’s made my films look better. I get a lot of credit that really should be going to John. Do you tend to work with the same creative teams over and over again? I do, and they now feel like family. [War Horse producer] Kathleen Kennedy has been with me since 1978. My cinematographer, Janusz Kaminski, has made every movie with me since Schindler’s List. Michael Kahn has cut every motion picture I’ve directed since 1976 when we made Close Encounters together. Rick Carter has worked as a production designer on 15 of my directed films. I really believe in the family of collaboration and so John Williams is certainly no less or no more important than the entire group of all of us. However, Johnny does make a contribution that goes right to your heart. A lot of the contributions of my other collaborators are subliminal. You don’t really single them out for credit – although without them, some of the films wouldn’t have the impact that they have. John certainly has the most considerable impact because his music immediately bypasses the brain. It goes right to your heart. That’s the way it’s always been with him. He’s an amazing talent. Your portfolio of movies is incredibly diverse. What is your decision process when you choose a new script? I’m not sure I choose my movies; they choose me. I know that might sound glib, but it’s true. I don’t go through a torturous intellectual process to decide what to direct. I know when I want to direct the second I read something or the second I hear a story. When it grabs me in a certain way, I know I want to direct it. Do you think of your children when you choose a new project? It’s interesting you ask this question because my daughter Destry had a lot to do with me directing War Horse. She’s in her teens and she’s been competitively riding for around 11 years – but even before I went to see the play, she said to me, “You have to make War Horse. You have to make it for me.” So I did. Are you familiar with horses? Do you ride? We have 10 horses at home, and we’ve been living with horses for almost 18 years. In fact, my wife rides dressage – and that’s another reason to qualify me to direct War Horse because I know horses that way. I don’t ride, but I certainly know how to muck a stable. “War Horse,” the Academy Award-nominated Best Picture, is a story of incredible friendship, loyalty, courage, hope and tenacity. 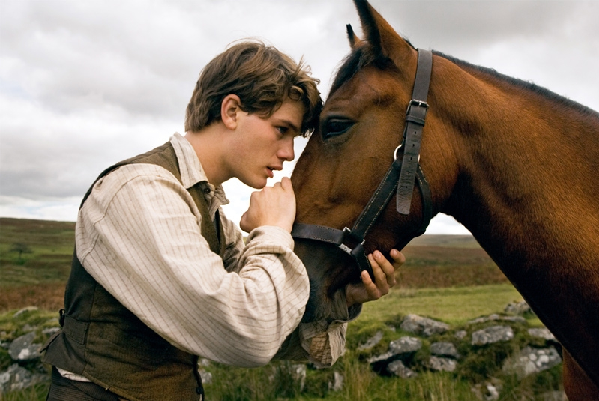 Based on the Tony Award-winning play, and set against the sweeping canvas of World War I, this deeply heartfelt tale begins with the remarkable friendship between a feisty colt named Joey and his young trainer Albert (Jeremy Irvine). When they’re forced apart by war, the film follows Joey’s extraordinary journey as he changes and inspires the lives of everyone he meets. No matter where they go or what they experience both boy and horse keep forging ahead, driven by devotion and the hope of returning home. Filled with spectacularly rich visuals, “War Horse” is one of the most powerful and moving stories of friendship and love ever filmed. You can find War Horse on Blu-ray and DVD now, at retailer's Nationwide.